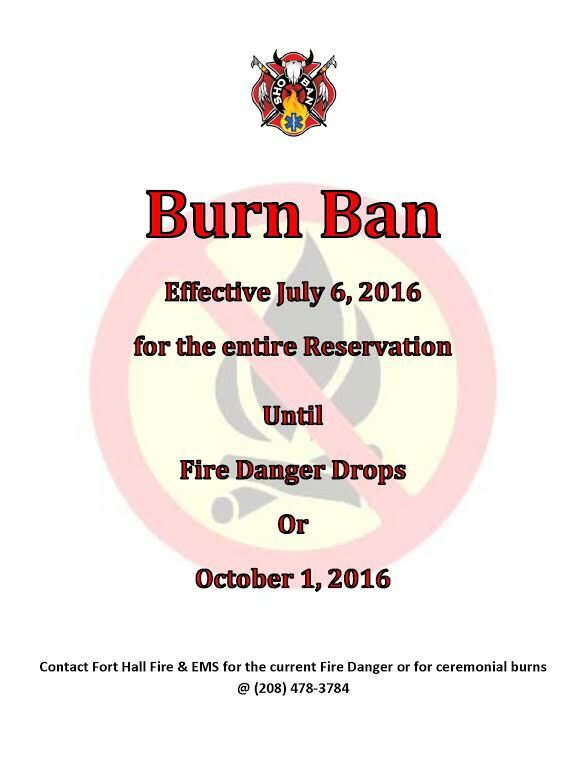 Fort Hall, ID - The Fort Hall Fire & EMS District has put the following in Fire Ban in place effective Wednesday, July 6, 2016. The Fort Hall Fire Chief Brian Briggs met with the Fort Hall Business Council and had a resolution put in place to Ban Igniting of Fireworks and a Ban on Burning throughout the entire reservation. This ban will go into effect starting July 6, 2016. The only exceptions to the burn ban will be ceremonial fire (e.g. Sweat Lodge, Sundance, etc.). 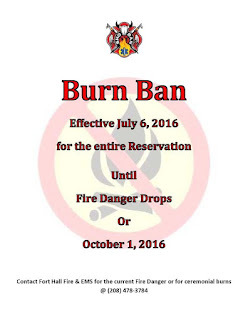 The burn ban will be in place until the fire danger drops or October 1, 2016, whichever comes first. Questions on daily fire rating can be directed to the Fort Hall Fire & EMS District at 478-3784.